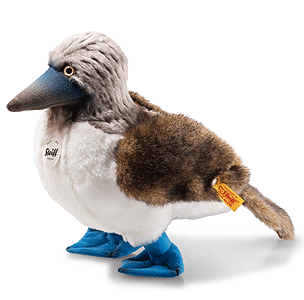 Booby the Blue Footed Booby is hand made in the finest white, grey and brown cuddly soft plush and wears the famous Steiff trademark, Button in Ear with yellow tag. This 24 cm tall blue-footed booby stands proudly on his blue legs. His white stomach provides beautiful contrast with the blue and brown shading on his head, face and bill. His cuddly brown wings are sure to inspire endless petting. The assorted fabric types used in Booby‘s design make him a very special playmate. Great for developing a child's sense of touch. A beautiful gift idea.